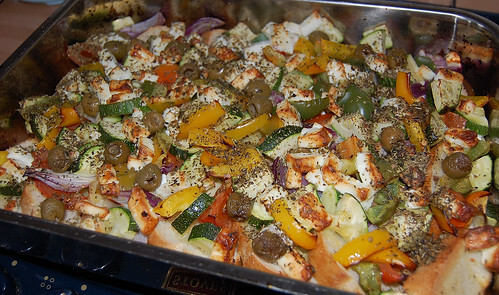 Yummy veggie bake with feta, originally uploaded by indiaeden. I'm not much of a cook. I can cook fairly well,but I don't enjoy it,so Woody (who is an excellent cook ) ,does pretty much all of the cooking,(and shopping) around here. There are days though,when he works late that I have to prepare dinner. I like quick one pot type cooking,so I can get on with other more interesting things. This is a recipe I came up with one day when we had lots of lightly toasted bagels left over from lunch. I can't stand wasting food,so I chucked them in a big pan with loads of chunky cut peppers,courgettes,red onion,some whole cherry tomatoes,olives and a whole packet of organic veggie feta. (minus the bits I scoffed as I was chopping! ). Then I poured a generous glug of extra virgin olive oil over the top,sprinkled lberally with oregano,and bunged it in a hotish oven (about 200,I cook everything on 200) for about 20 ish minutes. The results were surprisingly delicious,so I make it fairly often. Usually I use french bread from my local shop,but I have used yesterdays ciabatta. Really any dryish bread works well,preferably from the day before. I know it sounds odd,but honestly it's yummy. I make a vegan version for India,she likes garlic in hers,and a little salt sprinkled on,obviously minus the feta. A few pine nuts sprinkled on are nice too. Even Woody loves this, (he's not easy to please),and we both enjoy a good glass of chilled Pinot Grigio to wash it down.